The text is from St. Luke’s Gospel chapter 1, and employs the words of the Virgin Mary, which she offers up on hearing that she is pregnant with our Lord. It is to be heard at Evensong in any English Cathedral any day, and has been set by thousands of composers, but none of them quite like this. ! Martin Palmeri comes from Buenos Aires and you may well, as a consequence, immediately think of Astor Piazzolla. Palmeri has composed many choral works and operatic pieces and in many the spirit of the Tango is to be discovered just as it haunts the music of Piazzolla. And the fact that the scoring includes the traditional ‘Bandoneon’ also acts as a further nod and a wink to Palmeri’s illustrious predecessor. The composer divides the text into eleven sections, separately tracked, splitting it between the soloists and the choir with occasional short instrumental sections. And I should add immediately that they are all superb, vividly recorded with clear diction, good intonation and a real passion and understanding of the music. The recording was the result of a series of performances mostly in Poland. It is perhaps curious that such ‘Argentinian’ music should have been so willingly embraced by these Polish performers. The work’s first performance actually took place in Milan but its has been enthusiastically grasped by Kinga Litowska and she has promoted it throughout Poland. On the plus side also is the fact that the piece is obviously unique in concept and has many beautifully memorable melodies: try the duet ‘Suscepit Israel’ (track 9). Those of you who know Piazzolla’s opera Maria de Buenos Aires will not be surprised by the opening movement, which is very contrapuntal at times, even fugal, and in an earnest minor key. The finale, which is the ‘Gloria’, contrasts this with the major key and by the ‘sicut erat in principio’ we have a fully-blown fugue followed by much imitative counterpoint .The booklet tells us that Bach is a strong influence on Palmeri and is “absorbed into the musical tissue”. Palmeri even quotes Bach (sometimes difficult to spot) as in the ‘Sicut locutus est’ movement (track 10). These are “enriched with elements of the tango” and that might be a downside for many listeners as every movement is a Tango be it slow, or fast and aggressive, which they can often seem. Other movements are Romantic and even what my daughter called ‘soupy’ when she heard it, as in the Duet ‘Et Misericordia’ with its jazzy minor 7th and 9ths. The start of the ‘Quia Respexit’ is distinctly ‘nightclubby’. But you may well legitimately observe – “why should the devil have the best tunes”? My main sadness is the length of this disc. 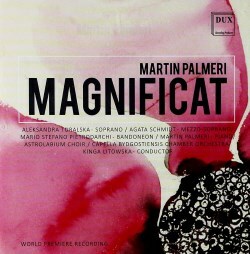 Looking at Palmeri’s website there are several other choral works some of which could surely have been included to make up some extra time for your money. He is hardly a well-known figure especially here in the UK and any further presentation of his work could have been very rewarding. The booklet has a brief introductory essay by Palmeri then a detailed description of each movement by Aneta Derkowska. There are colour photos of all involved and extensive biographies BUT the text is not supplied nor any translations offered, so I hope you have a Bible or ‘Book of Common Prayer’ handy if needs be. If this sounds your sort of bag then search it out. As for me, I may well consign it to the ‘fascinating oddity’ category.